Background: The purpose of this study was to compare the frontal lip cant changes in common facial asymmetry (FA) cases after simultaneous maxillomandibular distraction osteogenesis (DO) and mandibular DO with maxillary orthognathic surgery. Materials and Methods: Retrospective analysis of FA cases at tertiary craniofacial referral was performed. Patients of either gender with all medical imaging records and pre- and post-operative (1 year) facial photographs in natural head position were included in the study. The lip cant change was assessed by the ratio of the linear dimension between affected and unaffected side labial commissures and the bi-pupillary reference line. Difference between the pre- and post-operative ratio was analyzed. Statistical analysis was performed for the outcome. P ≤0.05 was taken as significant. Results: The mean preoperative measured value of the affected side was 0.845 ± 0.036 while the postoperative value was 0.95 ± 0.032. The effective change was 0.11 ± 0.044. The postoperative ratio compared with simultaneous DO case was 0.98 ± 0.06 while that of mandibular distraction with orthognathic surgery was 0.92 ± 0.08 (P = 0.048). 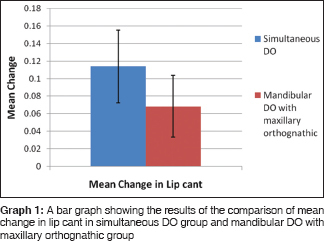 The mean change of the simultaneous DO case was measured as 0.114 ± 0.041 while the same for the mandibular distraction with orthognathic surgery was 0.069 ± 0.035 (P = 0.013). Discussion and Conclusion: The results indicate that the simultaneous DO yields more better frontal lip cant change between both halves than the mono-DO with orthognathic surgery. The mean change is much higher in the simultaneous DO cases indicating a more effective correction and desired result. The biological reason and lip musculature mechanism behind the response in both conditions are discussed. Facial asymmetry (FA) is a common presenting complaint to a maxillofacial surgeon. When a significant, observable difference manifests between the right and left halves of the face, it leads to functional as well as esthetic concerns. The treatment lies at correcting the underlying cause. The etiology of FA includes congenital disorders, acquired diseases, and traumatic and developmental deformities. The causes of many cases of developmental FA are indistinct. Management of FA aims at correcting the underlying disorder. Hemifacial microsomia (HFM) and the FA caused by the temporomandibular joint ankylosis (TMJA) render a formidable challenge to the surgeon for FA correction., The most striking and visible feature of the FA is the lip cant. This soft-tissue asymmetry, lip cant change, is determined by the difference in height of the labial commissure bilaterally. There are several options to correct the FA – they range from simple camouflage surgeries, orthognathic surgeries, and distraction osteogenesis (DO) to facial reanimation in cases of neurological issues. In cases of HFM and TMJA, the preliminary choice of correction is mainly orthognathic followed by DO. In this situation, the basal bone position is modified that causes the soft-tissue profile of the patient to be altered. There have been several reports of comparison of soft-tissue changes pre- and post-treatment. Literature has a few study of the effect of the soft-tissue modification compared to the presenting degree of FA, especially in the Indian population. The aim of this study is to compare the frontal lip-line cant in patients (for TMJA/HFM) who had undergone FA correction (either by simultaneous DO or mandibular DO with or without by maxillary orthognathic surgeries) at 1-year postoperative period. The data for this study are drawn from the hospital records and in a retrospective fashion. From the existing records of an Indian tertiary maxillofacial surgery center, all diagnosed (by history and phenotypic expression) and treated cases of HFM satisfying the following criteria were included in the study. All simple HFMs, belonging to type I (Pruzansky's classification), were included in the study. Similarly, all treated unilateral cases of TMJA (as previously defined) as well as Pruzansky's type IIa HFM with normal growth on the unaffected side were included in this study. All these patients had undergone simultaneous DO of the mandible and maxilla or a DO of mandible with orthognathic surgery of maxilla. Only patients with all medical imaging records and pre- and post-treatment (at least 1 year) facial photographs in natural head position were included in this study. Exclusion criteria included the patients with improper records or photographs, patients presenting with other types of HFM, bilateral TMJA, or other local/systemic complications that impeded the lip cant including neurological abnormalities were excluded from the study. Patients who had other interventions including other surgical treatments, orthodontics, were not included in this study. All patients with ocular (positional) abnormalities were excluded from this study. All surgical treatments were done by a single surgeon with experience of more than two decades. The choice of the technique was determined on a case-by-case basis with consideration including but not limited to those of patient's esthetic expectation, willingness, and financial choices. Demographical details were collected from case records. For the lip cant measurements, from diagnostic photographs, the method by Namano et al. was employed. From the frontal photographs, using Corel DRAW, version 12.0 software (CorelDRAW software, USA), the following lines were drawn: (1) A horizontal line drawn through the ocular commissures, running through the iris. (2) A horizontal line drawn connecting the corners of the lip. (3) A vertical line drawn along the iris of the eye running toward the line 2. This was done in both the affected and unaffected side. To account for any photographic magnification and avoid/negate the difference in magnification, the ratio of the affected to unaffected side was calculated and used. The tracings and measurement were performed by author and two blinded, trained, calibrated, assistant surgeons and an average taken as the final value. When the affected half value reached near to 1, it is understood that the affected side has regained a normal frontal lip cant. It can be deciphered that more the value nearer to 1, the better the correction. Similarly, the difference between the pre- and post-operative ratio gives the extent of the correction. All the values were entered in Statistical Package for Social Service (SPSS, version 16.0, IBM, Chicago, IL, USA). Descriptive statistics are presented. Unpaired t-test was used to differentiate the outcome measures between the simultaneous DO and DO with maxillary orthognathic approach. A P ≤ 0.05 was taken as significant. Thirty-two patients fulfilled the inclusion and exclusion criteria. Of them, 21 (65.6%) were females and 11 (34.4%) were males. The mean age at the time of surgery was 22.34 ± 3.7 years. The youngest patient was 20 years while the oldest was 29 years of age. Of the 32, 11 (34.43%) were cases of TMJA while the remaining were HFM - type 1. 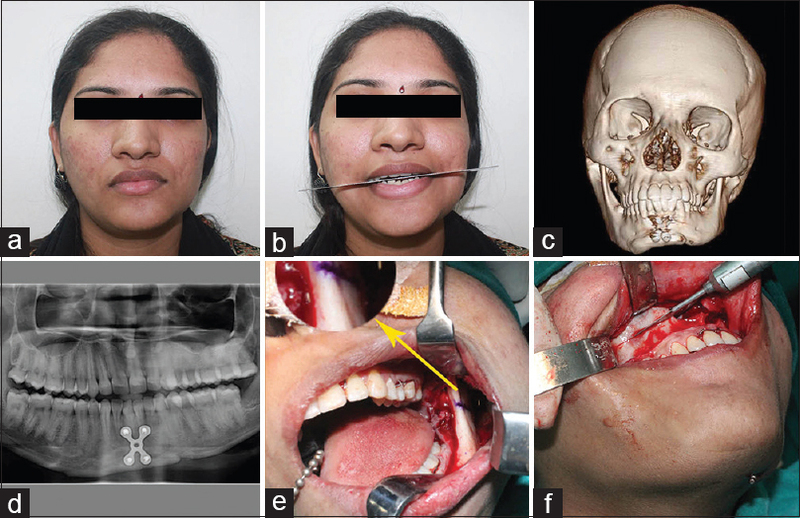 Simultaneous DO [Figure 1] and [Figure 2] was carried out in 25 (78.1%) cases while mandibular DO followed by maxillary orthognathic surgery was performed in 7 (21.9%) cases [Figure 3] and [Figure 4]. The distribution of age, gender, and type of deformity was not statistically significant between the two groups. The mean preoperative measured value of the affected side was 0.845 ± 0.036 (minimum 0.78 to a maximum of 0.92). The postoperative measured value of the affected side was 0.95 ± 0.032 (minimum 0.03 to maximum of 1). The effective change was 0.11 ± 0.044 (range: 0.03–0.2). The postoperative ratio compared with simultaneous DO case was 0.98 ± 0.06 while that of mandibular distraction with orthognathic surgery was 0.92 ± 0.08 [Figure 5]. This difference was statistically significant (P = 0.048). The mean change of the simultaneous DO case was measured as 0.114 ± 0.041 (range: 0.03–0.2) while the same for the mandibular distraction with orthognathic surgery was 0.069 ± 0.035 (range: 0.04–0.012). The difference between the outcomes measured was statistically significant (P = 0.013). The above results indicate that the simultaneous DO yields more better frontal lip cant between both halves than the mono-DO with orthognathic surgery. The mean change is much higher in the simultaneous DO cases indicating a more effective correction and desired result [Graph 1]. In nongrowing adult patients, FA was traditionally treated with jaw osteotomies followed by acute orthopedic movement and subsequent rigid osseous fixation. This procedure carries the inherent risk of relapse caused by the inability of muscles to adapt owing to the acute stretch often compromising the outcome. Furthermore, poor soft-tissue adaptation often leads to compromised function and esthetics. 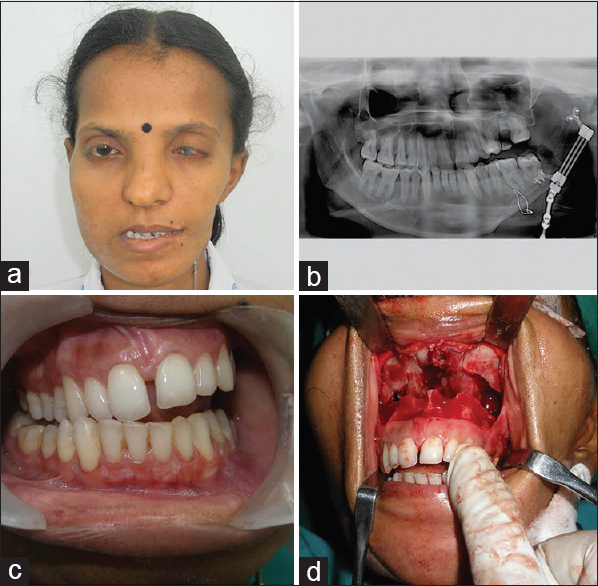 Severe deformities often require autogenous grafting to fill the significant osseous defect. This procedure could potentially cause infection, pain, and donor site morbidity along with overgrowth of the graft. DO has become a widely accepted method to overcome the above drawbacks and treat FA conditions. It is a process, in which new bone is stimulated to form between the surfaces of disrupted bone segments which are separated by incremental, controlled physical traction. This method of expanding bone after a surgical corticotomy was first described and reported by Gavril A. Ilizarov, an orthopedic surgeon and has gained wide applicability in the area of craniofacial deficiencies since then., DO delivers a predetermined, traction force applied to bone which also creates tension in the soft tissue, initiating a sequence of adaptive changes termed distraction histogenesis. This concomitant expansion of the soft-tissue functional matrix allows for multidimensional expansion of the jaw bones. Under the influence of tension produced by DO devices, active histogenesis also occurs in skin, fascia, blood vessels, nerves, muscle ligaments, and periosteum. Because the lengthening procedure progresses slowly over several weeks, the soft tissue is able to stretch and adapt gradually without loss of any damage. For patients who have FA, this secondary gain is significant because they usually lack both bone and overlying soft tissue., The result of this present study has proved that frontal linear lip cant changes are stable and reliable with a significant difference with other procedure at the end of the observatory period. With the use of simultaneous DO, the occlusal morphology and the cant are often self-corrected as described previously. In the mono-DO with maxillary orthognathic surgery, orthodontic intervention was required to correct the occlusal cant at a later stage. This is an added advantage of the simultaneous DO. Present observation was consistent with the findings of reported literature of Ortiz Monasterio. This phenomenon has probably contributed to the clinically pleasing appearance of the participants in simultaneous DO group. The other contributing factors that were not analyzed/considered in this study include soft-tissue thickness variability or maximal muscle tonicity and probably these factors might have contributed to the individual variation of each case in this study. Frontal lip cant is the final product of the difference in height of the labial commissures bilaterally, and the vertical height of commissure is determined by the upward pull from the zygomaticus major and levator anguli oris muscles and the downward pull of the depressor anguli oris muscle., Using these three muscles as variables and simplifying these vectors as a two-dimensional relationship, it has been previously demonstrated that the depressor anguli oris muscle contributes to the change of the commissure position in the postoperative period which is due to the disruption of the equilibrium between the adjacent musculature around the corner of the mouth., During simultaneous DO, the muscle attachments that determine the vertical location of these muscles usually move apart, depending on the degree of deformity. The depressor anguli oris muscle attaches in the mandibular proximal segment that moves backward. Because the manipulation of the maxillary cant results in a change in the mandibular proximal segment's cant, the depressor anguli oris muscle attachment undergoes displacement as well and thus contributes to the lip cant adjustment. In orthognathic cases, this happens rapidly causing muscles to stretch, inability to adapt leading to relapse, while in simultaneous DO cases, this is slow thereby leading to better adaptation. In addition, the increase in soft tissue that usually accompanies the DO in mandible also could contribute to the phenomenon. Another muscle to be noted is the buccinator group of muscle fibers. The buccinator muscles form the deep layer of the orbicularis oris muscle., The fibers of the middle of the muscle decussate at the angle of the mouth, and the uppermost and lowermost buccinator fibers pass without decussation across the midline into the upper and lower lips. The muscle fibers originating from the mandibular alveolar bone pass to the upper lip and those from the maxilla pass to the lower lip., The lower part of maxillary alveolar bone, from which the buccinators muscles originate, is the region changed during DO procedures. When the mandible is moved forward, the buccinator muscle interferes with the ipsilateral lower lip and lip commissure. In the present context, all the muscles play an important role. However, many more factors could contribute to the change in the lip commissural height, considering and relying on the direction of the musculature as a vector., Several points including the listed ones have to be further considered. First, the attachment point of the depressor anguli oris muscle can be altered, depending on the change of the mandibular position. This can occur vertically, horizontally, or sagittally. Second, the location of the labial commissure is a long distance from the muscle attachment points; thus, it is difficult to confirm that the hard tissue location change readily occurs after DO. Finally, a vertical movement of the hard tissue changes not only the muscle's length but also the thickness as described previously., The present study results are in concurrence with this known knowledge. The study design is retrospective in nature and drawn from archival records of the center. For this very reason, no sample calculation was performed. The exact reason for the choice of a particular technique was determined on a case-by-case basis with consideration including but not limited to those of patient's esthetic expectation, willingness, and financial choices. This in turn has caused one arm of the study group – simultaneous DO group to have a larger sample – 25 cases accounting for 78% of all cases. Probably, this could emanate from the operating surgeon's preference, training, school of thought, economical viability, patient expectation, etc. However, the statistical tests employed reveal a significant difference in the outcome measures. This indicates that in spite of this inherent deficiency, the results indicate a strong difference in outcomes. This being a single referral center, hospital admission bias could have also crept in. The future studies in this direction should attempt to have an equal number of cases in both the techniques as well as have adequate sample size and power of the study, to draw more meaningful conclusions. The advantage of simultaneous DO includes a single-stage correction of several problems including occlusal discrepancy, obviating the need for later major orthodontic treatment and over correction and will yield predictable results that are esthetically and functionally pleasing. This manuscript presents the frontal lip cant difference between simultaneous DO and mandibular DO with maxillary orthognathic surgery. The efficacy of the simultaneous DO in correcting the frontal lip cant in FA cases and its probable mechanism and advantages has been discussed. Cheong YW, Lo LJ. 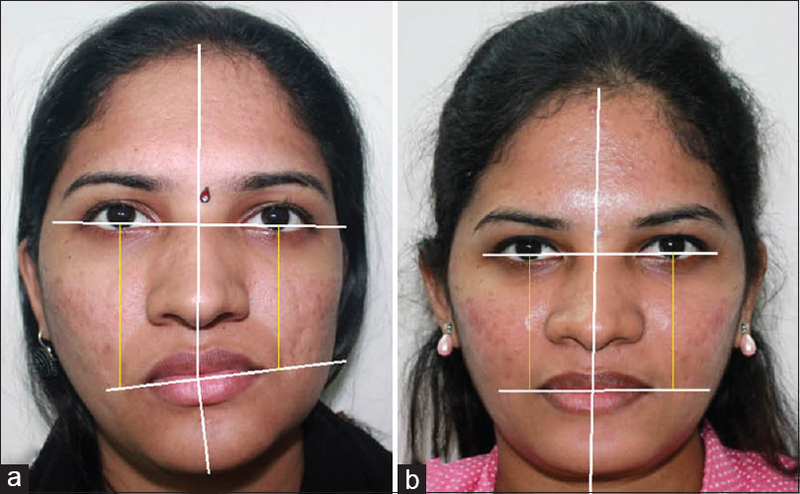 Facial asymmetry: Etiology, evaluation, and management. Chang Gung Med J 2011;34:341-51. Balaji SM. Change of lip and occlusal cant after simultaneous maxillary and mandibular distraction osteogenesis in hemifacial microsomia. J Maxillofac Oral Surg 2010;9:344-9. Balaji SM. Teeth position, eruption and temporomandibular joint ankylosis. J Maxillofac Oral Surg 2009;8:340-3. Padwa BL, Kaiser MO, Kaban LB. Occlusal cant in the frontal plane as a reflection of facial asymmetry. J Oral Maxillofac Surg 1997;55:811-6. Hwang HS, Min YS, Lee SC, Sun MK, Lim HS. Change of lip-line cant after 1-jaw orthognathic surgery in patients with mandibular asymmetry. Am J Orthod Dentofacial Orthop 2009;136:564-9. Phillips JH, Bush K, Bruce R. Hemifacial microsomia. In: Greenberg AM, Prein J, editors. Craniomaxillofacial Reconstructive and Corrective Bone Surgery: Principles of Internal Fixation using AO/ASIF Technique. New York: Springer; 2002. p. 727. Pruzansky S. Not all dwarfed mandibles are alike. Birth Defects 1969;1:120-9. Namano S, Behrend DA, Harcourt JK, Wilson PR. Angular asymmetries of the human face. Int J Prosthodont 2000;13:41-6. Monahan R, Seder K, Patel P, Alder M, Grud S, O'Gara M. Hemifacial microsomia. Etiology, diagnosis and treatment. J Am Dent Assoc 2001;132:1402-8. Ortiz Monasterio F, Molina F, Andrade L, Rodriguez C, Sainz Arregui J. Simultaneous mandibular and maxillary distraction in hemifacial microsomia in adults: Avoiding occlusal disasters. Plast Reconstr Surg 1997;100:852-61. Kim YH, Jeon J, Rhee JT, Hong J. Change of lip cant after bimaxillary orthognathic surgery. J Oral Maxillofac Surg 2010;68:1106-11.